Get ready for some fun in the sun with this Milly halter maxi. Perfect for that beach weekend getaway, backyard BBQ, or boat party. Shown here with the Rodrigo Otazu's Insanely Chic Crystal Cuff and Rodrigo Otazu's Narnia Cuff. This dress runs true to size. We recommend going one size down for backup. (see following fit notes for exceptions). LENGTH: Floor length - One length available. Measures 58'' from shoulder to hem and recommended for heights 5'2''-5'7''. Blue printed charmeuse(100% silk). Halter neckline with pom-pom detail. Open back. Tonal sash ties around waist. Made in USA. See size and fit tab for length. 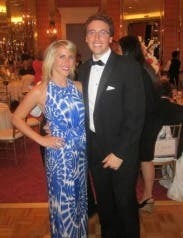 I wore this dress to a formal gala, that I co-chaired, last night, and I never wanted to take it off! It is absolutely GORGEOUS! I dressed it up with high silver strappy heels, rhinestone bangle bracelets and Crislu Classic Lady earrings. I honestly don't know when I've received so many compliments on a dress before! People I didn't even know kept coming up to say how beautiful the dress was! It is a total standout! I loved it because it had such a different look than do many gala gowns. The fabric is a soft, luxurious silk and the style is incredibly comfortable. 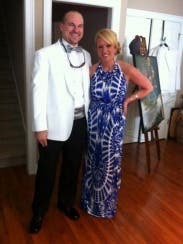 The colors of electric cobalt blue and super bright white looked amazing (especially after a quick spray tan!). A messy/cute high ponytail and sun kissed make-up gave a great beachy elegant look. I normally wear a size 4, but found this dress to run a bit large, so I wore my back-up size 2. The length was perfect for me (I'm about 5'5" and had on 3 1/2" heels.) I can't recommend this dress highly enough! It's not for the wallflowers. This dress will make you a total standout!! would this be a good dress for a small baby bump? Hi ladies, this dress does have a waist band and not a ton of stretch around the mid-section. It may work with a small bump, but not if you're very far along. Check out our bump-friendly occasion at the top of the page for other options! Agreed. There's not much stretch, so it would only work with a tiny baby bump. Welp, I took the chance and rented it! I'm only four months and still small so fingers crossed! I loved it too much not to do it. I'll post my review after I wear it in two weeks :) wish me luck! Sara, did it end up working? I am in the same situation, almost 5 months but I have a very tiny baby bump, did it work for you? The most unforgettable moment was getting a ton of compliments about the dress! I felt like a million bucks! I rented this dress for our local hospital ball. The dress was absolutely perfect! It ran a little big. I normally wear a 6 in most dresses but the 4 fit perfectly! The length was great with a 2" heel. I had TONS of compliments all night!! Hi Johnice, you may want to try an 8 with your free back up size as a 6. This dress is fitted at the waist. I rented this for my 25th birthday party. I ordered a 4 & 6. I am only 5'4" and the 6 ended up being way too long. Even with heels it was 4 inches on the floor. The size 4 fit great but was a little snug on the hips. I wore about 3 inch heels with the dress and it still touched the floor. (see pictures) The print is perfect and the neckline and low back are very flattering. The material was so soft and you can tell it's a very high quality! It is not a stretchy material so you definitely need to order 2 sizes if you are a curvy girl, just to be safe. Oh and I'm a 34B- which left a lot of room in the chest area, but I don't think it looked bad. This dress could definitely handle a girl with a larger bust. Obviously with the low back it requires a NuBra. Other than it being too long I couldn't say anything negative about this dress!! I absolutely LOVED it! This dress was over the top amazing. Loved the bright color and the low back gave it some drama. It does run a little large, I am usually a size 8 in dresses and the 6 fit perfectly. It was light (silk) and airy at the HOT Florida beach wedding. I would OWN this dress if I could find it online. 100% stunning and one of my fave rentals thus far. I am about 5' 7" and I was able to wear 1" wedge sandals and it just grazed the ground. Hope, what type of bra did you wear with this dress or did you go without one? Hi Megan, we recommend Hollywood fashion tape to secure the sides of the dress or a NuBra for more support. Megan, I wore the NuBra. It game some support and the way the dress is cut give you some help also. Its SUCH a nice dress!!!! This was my very first RTR experience, after a recommendation from a friend. I ordered this for a Sunday evening wedding on Memorial Day wknd. The event was completely outdoors and rustic - beautiful. My biggest challenge was finding an adhesive backless, strapless bra to hold the girls up. 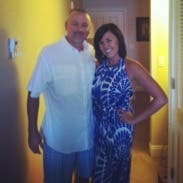 But it was totally worth the effort - this was my husband's favorite dress I've ever worn (excl. our wedding day, obvi) and I received tons of compliments. I just ordered my second rental and am a huge fan of the site! 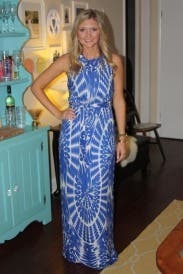 I highly recommend this dress for any summer event - you can dress up or down with accessories. Hi Johnice, we recommend Hollywood fashion tape to secure the sides of the dress or a NuBra for more support. I used a backless, strapless adhesive bra AND fashion tape on the sides. My hubby had to assist me. But once it was all in place, I felt secure. RTR helped make my birthday trip to Napa the best vacation ever!! Rented this dress for a girls trip to Napa. It was the perfect choice for a day touring Vineyards. Everywhere we went women would stop to ask me where I found such an amazing dress. The color is striking and the design so flattering. I am normally a 4-6 but ordered a 2 after reading other reviews. The 2 fit perfectly in the body as I am narrow in the hips but it was a bit short in the torso. Otherwise fantastic. The material is light enough for a 90 degree Napa day but thick enough to allow smaller busted women to go sans bra. Overall 5 star! Very sad to send it back and would purchase immediately if it was available! Worth every penny. RTR helped make this trip the best vacation ever! The dress looks great on you! I am about the same size as you height/weight (5'7", 125lb). I rented this dress for a garden wedding this coming September. There was not an option to rent a 0R, so I rented the 2R. Did it fit you ok? Also, what size heel would you recommend? Hi Stefanie, the size 2R should be okay in fit but may have to be worn with flats if you are 5'8" as it only comes in a regular length. So many wonderful compliments on the dress! I experienced some complications with the delivery of this dress, but I was so happy to receive it the night before my cousin's wedding! I ordered a 6R, with the 4R as a backup, and wound up wearing the 4R. The top was a little blousy looking with my smaller chest, but the belt helped to cinch the extra fabric in place. I opted to not wear a bra with this dress, since it has a lower back and did not need to use any sort of tape to hold the dress in place - it stayed close in all the right places and I felt totally comfortable and not scared anything might unexpectedly pop out! I am 5'7" and the dress was a little long in the back wearing flat shoes, but it was definitely manageable. From the front, it was the perfect length. My only criticism of this experience has to do with the condition of the dress. I was fortunate that the 4R was the better size for me - I would not have been able to wear the 6R because the beaded collar was falling apart. Additionally, when I got into the car to drive to the event, I noticed a stain down the front of the 4R that I hadn't seen the night before. At that point, it was too late to change so I had to hope that no one else would notice. I would guess that this dress is a popular rental, based on both the 4R and the 6R's conditions, but I was definitely expecting the dresses to be repaired/cleaner. Overall, I was happy with the dress and RTR was very accommodating when I expressed my concerns to them over the rental. Additionally, I received more compliments over my outfit than I can even count! This is a great dress for a wedding or outdoor formal event! Perfect for a summer wedding in California! This dress was perfect for a summer wedding I attended in LA. I received so many compliments! I think it runs slightly large as the 4 fit me perfectly and I typically wear a size 6. I wore a nubra with it but it could definitely be worn without a bra. It was quite long because I'm 5'7" and wore 3" heels and still had to hold the bottom up a bit as we were dancing and walking up and down stairs. All around a great dress, though! Beautiful dress which stood out all night! I wore this dress for a fairly formal summer wedding and it was perfect! It was easy to dance in, very forgiving after eating all the wedding treats and loved the color. I am usually closer to a 4 but the 2R fit perfectly. I am about 5'5" and the length was also great with about 4 inch wedges. I am tempted to buy this dress! Feeling comfortable and beautiful all night long, didn't want to take it off or send it back! This dress was exactly what I was hoping for and more! I wore it to my friends summer wedding and it was super comfortable and still very flattering. I think the low open back and back slit were my favorite features. I normally wear a 4 but ended up wearing the 2 because it runs a little big. I also got the stick on NuBra and it worked perfectly under the dress. All night people were saying how much they LOVED it! Such a hit and another great RTR success!! I rented this for my rehearsal dinner and I got compliments non stop!!! I originally ordered a 2 and a 0.. of which they only sent one ( without calling to let me know).. but the 0 fit perfectly.. crisis averted. I only wish I had pictures of the dress!! Classy but edgy dress for a late summer southern wedding! I wanted something special for my cousin's wedding, it was a fairly large southern wedding and I thought the dress was classy and but had enough edge to make it fun! Got lots of compliments. I have never received more compliments in my life than I did in this dress... it is effortless! I rented both a two and a four (I typically wear a four in dresses), and I ended up wearing the two. The four was huge on me around the bust and waist area. I would definitely recommend ordering a size down. How many compliments I got! 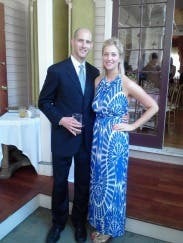 The dress was great for an evening summer wedding! It runs a little large. I am usually an 8, but wore the 6. Never did wear it to the event...after trying it on it proved to be large and unflattering. I rented this for an annual horse racing event and although the pattern was really pretty and fun, and the neckline was amazing, it just didn't work on my petite frame and I felt sort of drowned. The dress was also too big - If you are petite, I would shy away from this dress. It would probably work a lot better on somebody taller. Striking color and print! Shows off neck, shoulders, and waist. Must wear tall shoes. 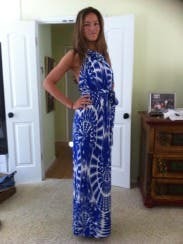 Gorgeous, easy to wear, maxi dress. The cut is very well-constructed and has a heaviness to it that feels great on. I received numerous compliments throughout the night. Would be great with a silver or gold, chunky bracelet or cuff. If you are looking for a distinctive dress that can be worn to a cocktail party, fundraising event, or wedding, this it it! I will definitely be swayed by additional Milly options offered by RTR in the future. This dress didn't come without it's issues. I rented a size 8R and 6R (I'm normally an 8 sometimes a 10 if a dress is very fitted in the hips...but never a 6). I ended up wearing the 6 because the 8R wasn't available. The previous renter had either damaged or not returned the dress in time. So only the 6 was sent, that was upsetting but customer service was very helpful and sent me another dress in a size 8 for free. The 6 ended up fitting fine, which was a relief because I really wanted to wear this dress! The 6 was in sorry shape though, there was a stain on the chest (looked like a spilled cocktail) I didn't notice it until I already had it on and was in the car en route to the wedding--it wasn't very noticeable but disappointing none the less, the hem was frayed in the back, one of the balls on the front collar was coming undone, there were some pulls in the fabric. Luckily it's a busy pattern and the wears/tears were in inconspicuous places, but I still paid good money to rent the dress, I would expect that it not show up dirty and tattered. Long story short, I loved the dress. Glad I got wear it, and the issues I experienced weren't enough to sour me on the experience as a whole. The compliments from both guys and girls made me feel comfortable and confident. The dress was perfect! I am about your same size... did you wear a bra? what kind? This dress is adorable in person. The cut is flattering, the colors are beautiful. I wore this to my wedding shower and received tons of compliments. I am super pear shaped (32 barely A) and 27 (4) size in jeans/shorts. The 0 fit perfectly. Didn't wear a bra but had a bought a stick on one. turns out the material was so flowy up top that I didn't need it. My only issue was that it was too long. I'm 5'4'' and there was about 4-5" of excess fabric. with platform wedges it barely skimmed the ground. had no problems dancing and moving around. Great dress, wish I could afford it to own. I received so many compliments on this gorgeous dress! It was perfect for the beach wedding reception. People came up to me just raving about my beautiful dress - and how eye-catching it was. I felt really gorgeous and love wearing unique items. You will stand out in this stunner! This was my first time renting from RTR - and I am hooked! The dress came on time and fit perfectly. I am normally a size 8, and felt this ran true to size, but was a little short on me (I am almost 6 feet tall, though). The 10 was too big. I just wore a shorter heel and it worked out just fine. I wore this to a beach wedding and have never received more compliments! Women, men, everyone loved it and I really stood out at the party. I didn't want to send it back! Great job, RTR, you've got a new customer. Loved the dress! My measurements: 33.5 Bust - 28.5 Waist - 37 Hips for size 4. I'm just under 5'10" and wore flats with it and it just skimmed the floor - I think the site says that the model is 5'10" and she's wearing heels in the picture so that can't be right. Got a lot of compliments - definitely recommend! I've never gotten so many compliments on a dress before. Perfect for a summer wedding. Make sure to get a NuBra because the back is open. Dressing up my new baby belly! 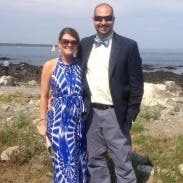 I wore this dress to my friend's beach chic NH wedding. I am almost six months pregnant so I was afraid the dress wouldn't fit. In speaking with the stylists, they told me that there is a low back which does clasp and has limited stretch although the dress does run about a size big. There's plenty of room in the belly area if you are able to get the chest/rib cage to fit with the clasp. Luckily it fit perfectly! The underlay or slip was a bit hot but the dress was overall gorgeous and awesome. I'm glad I took the chance and rented it! A ton of women came up to me and said how beautiful it was! I needed a somewhat formal dress to wear to a company party and had been eyeing it in every store I went to. I have a larger rib cage so the 4 fit better with some room. Definitely a longer dress so I probably should have worn heels. It was such a hit, everyone complimented on it. SO comfy to wear!! I was dressed perfectly for a fashion-focused event and I was super comfortable in this stunning dress. People kept coming over to me to give me complements on this dress. 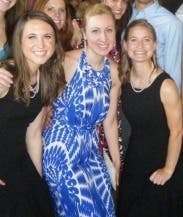 I rented this dress for an outdoor charity fashion show - it was a huge hit and very, very appropriate for the event. It was a sweltering day and I stayed relatively cool. I wear between a 4 and a 6 and the 4 was too tight around the thighs, but the 6 fit perfectly. The slit up the back was a pleasant surprise. 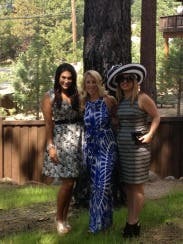 I am tall - 5'10, and i wore flats because my event was on grass and sand, and the length was perfect. It may be a teensy bit short for anyone my height who wears heels. Anyone shorter than 5'9 or so will need to wear heels with a 6 or larger. The back dips quite low, so a NuBra is a great option. I was even named "best dresses" by a fashion blogger for this fashion choice. Thanks RTR! This dress is really cute. The pattern is adorable and I loved the detailing around the neck. I am 5'7 and I had to wear wedges with the dress. Other than that, it was a great rental. i received so many compliments on this dress! I rented this for a wedding in Carmel, CA and it was the perfect mix of casual and elegant for the outdoor farm affair. I am 5'7" and wore 3.5 wedges with the dress and it just hit the floor (in the pic I am pushing the dress back a bit). The open back is a show stopper, as its so unexpected. So many people complimented me on this dress and how great it looked on. thank you RTR! This dress would have been AMAZING had it not been for me being 6-7 months pregnant. I'll try again after I get my body back lol! This is beautiful on and very comfortable to wear. It runs true to size, but it straight through the hips (so curvy girls, keep that in mind)! 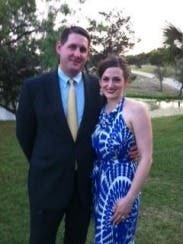 I wore this dress to a wedding in the Bahamas with pink/fuschia accessories. So cute and appropriate. I usually wear a size 12 in skirts an a size 8-10 up top, but i was able to fit into the 10. The top was a little loose but I fixed that with double sided tape. All in all great dress!!! Can be dressed up or down. Great dress. Highly recommended. Everyone wanted to know where I got my dress and I was so happy to tell them "Rent the Runway!" I was really bummed when my original dress ended up being unavailable for the wedding I was attending, but was so thankful to have this dress as my back-up. It fit beautifully and the complements just kept coming all day! The dress requires minimal jewelry because of the built in bib. Just a great pair of heels, a little yellow bangle, and some sparkley earrings and I was all set. I highly recommend this gorgeous dress to anyone! I am 5'2" and this dress was at LEAST 3" too long when I was in 4" heels. I was able to pin it up at the waist and becaue of the sash, it wasn't very noticable. If you are short be aware that you may need to alter it somehow. Otherwise, it was a beautiful ress and the embelishment around the neckline is wonderful. Really did not like the fit of this dress. If you have a large chest- DO NOT order. There were beads on the top missing on both dresses. It was pretty from far away but in all of the photos I look pregnant. The problem was the dress was very low cut and I had trouble finding the right bra. I think for a taller woman and a smaller cup size this dress would work well. 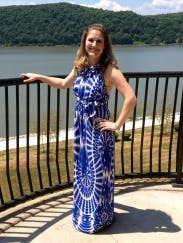 Fabulous dress for my law school graduation party. This dress fit like a glove and hung perfectly with flat sandals on. I could not have worn heels with it. Did not need a bra as the dress is fairly supportive and snug. This dress was a very beautiful color and pattern and I got many compliments throughout the night. I love the detailing around the neck. I wore the 4R and it was a little bit long even with three and half inch heels. There is an above the knee slit in the back and my heel kept catching a small bit in hem, which made me a little nervous on the dance floor. Customer service was awesome - I'm normally a 4 but had ordered a 2 as my backup since I had read reviews that it ran a bit large. Janna contacted me the morning before the dress was due to arrive and told me that the 2R was no longer available. She offered me the opportunity to add in a back up dress free of charge to make sure I had something that fit. She was quick and responsive and I really appreciated her attentiveness. The 4R ended up being fine and I utlimately liked it better than the back up I chose so I ended up sticking with my original choice!